India and the United States bilateral air exercise named 'Cope India 2019' to be commenced in West Bengal. Indian Air Force (IAF) and US Air Force (USAF) will participate in this air exercise which is scheduled to be held between 3rd December 2018 and 14th December 2018 in West Bengal. 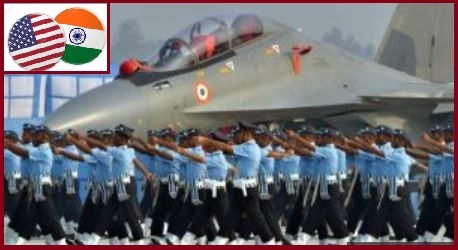 Cope India 2019 bilateral flying training programme will be held at two important airbases in West Bengal viz Air Force Station Kalaikunda and Air Force Station Arjan Singh at Panagarh. COPE INDIA 2019 will be long-standing bilateral US Pacific Air Forces (PACAF)-sponsored Field Training Exercise (FTX), conducted with IAF. It will be aimed at enhancing US-Indian mutual cooperation and building on existing capabilities, aircrew tactics and force employment. COPE INDIA 2019 will showcase US and India’s efforts and commitment to free and open Indo-Pacific region. Around 200 US airmen with 15 aircraft from 18th Wing at Kadena Air Base in Japan and 182 Airlift Wing of the Illinois Air National Guard will participate in it alongside their IAF counterparts. Cope India is the first such exercise was conducted at IAF air force station in Gwalior from February 2004. Cope India exercise included flight tests, practice and demonstrations as well as lectures on subjects related to aviation, air mobility & airdrop training and large-force exercises, in addition to fighter-training exercises. This exercise was held in 2005, 2006, 2009 and was last held in 2010.